After my rainy trip to Cedar Point and the subsequent closing of Top Thrill Dragster, I was looking forward to getting to Six Flags Great Adventure. Not only does Great Adventure have the only other Strata Coaster on the planet, they boast the world record holder for height (456′) and speed (128 mph) in Kingda Ka. Loading was very slow going and the park was only running two trains while two more set off to the side. If I didn’t have a Flash Pass I don’t think I would have waited for a second or third ride. Waits were 2 hours or more, but with the pass I waited about 15 minutes at most. While I didn’t get to ride Top Thrill Dragster thanks to the rain, I do prefer it’s theming and integration into the park over Kingda Ka’s. The launch area was near a foot path, but exotic foliage partially blocked the view of the launch section. There were onlookers and you could see the launches, but why not highlight them instead of hide them? Six Flags dropped the ball in that regard. 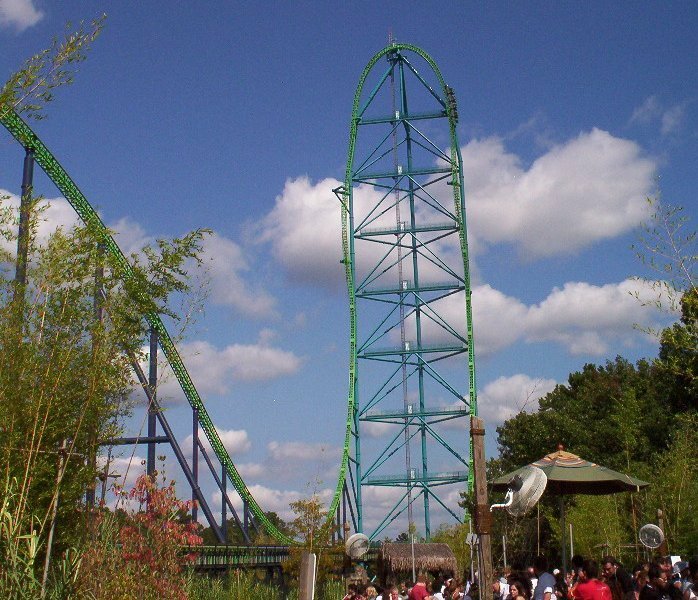 Kingda Ka’s intimidating launch and ridiculous height had quite an effect on the park-goers. In the station and aboard the trains people were saying their goodbyes. “If I die you can have my girlfriend,” said one teen-aged rider to a much older gentleman in line. One girl frantically told her boyfriend that she loved him just before the launch. She begged him to put his arms down for fear that they might be dislocated by the intense launch. Some gun enthusiasts standing near the launch area were yelling to their scared friend waiting to be launched. “When you hear the click you got 5 seconds [left]!” They laughed for a moment at the double meaning. If I could have taken excerpts from what people said you’d think we were in a war zone of some kind, not an amusement park. It was silly, but entertaining at the same time. On my first ride they sounded a horn. On my two later rides there was no horn, just the train shifting backwards a few feet and small click. It was the only warning before we started tearing down the long straight track. The faster it got I realized my head was pinned to the headrest and my cheeks were being pushed back. The train felt like it was going TOO FAST. It was unreal! Over in the new Plaza del Carnival section people just heard what sounded almost like thunder, but it came from the ground not the sky. As we hit top speed (128 mph), the train’s rattling like it might come apart and then you begin your ascent. Cresting the top was awesome. The view was amazing and the quietness was in direct contrast to the mayhem from seconds earlier. From certain seats I got a little pop of air at the top. Really about as much as you’d want when your 45-stories up. Extreme El Toro-like airtime that high would be pretty terrifying. Call me stupid, but I didn’t expect the drop to be that great. Maybe because I’ve scoffed at other ultra steep drops offered by coasters like Hypersonic and SheiKra. Kingda Ka’s drop is fun, you feel yourself dropping and you get that nice twist on the way down. Vehicles in the parking lot below looked like ants. As we picked up speed on your way back down to Earth the ride became pretty rough again. You crest that second hill and you smoothly decelerate. I think I was sitting towards the front when I got a little lift on that second hill. It was nothing to write home about, but just perceptible. If I were rating thrill rides, Kingda Ka would get a 10! But as a coaster it’s way too short and pretty rough in some seats. It has a reported time of 28 seconds, but it felt even shorter. Six Flags really needs to work on the capacity and loading time. If they have four trains, then they should use them. I also hear that break downs are very common. I experienced a brief amount of downtime on my trip. The points here are for the insane experience that the launch provided, that unforgettable view, and the long drop. It’s a great experience, but not a great overall coaster. I’m giving Kingda Ka a very weak 8. Final Rating – 8.0 (Great) Check out the rest of my rating scale here. Video could never do 128 mph justice, but here’s a professional roller coaster video of Kingda Ka. Kingda Ka is rated ‘EX’ for Extreme. It’s a 5 out of 5 on my Thrill Scale for of its insane height and ridiculous speed. What do you think about Kingda Ka? Leave a comment below. Kelly and Sir Coaster, it IS very frightening to look at the Stratacoasters and then willingly climb in to what feels like your vehicle to a certain death. However, I can honestly say that the amazing rush you get from conquering that fear is amazing. Plus, and I didn't believe my coaster freak friends when they told me this but it IS true, there are SO many coasters scarier than the stratas. You really don't have time to register anything like you do on Nitro and El Toro. Seriously. Do it or you'll regret it because it is HONESTLY not that bad. If you can handle Toro especially, Ka is a piece of cake. Loved this coaster. Give it a 9.5, with El Toro getting a 10 as the best in the park. I keep hearing that it's "just a launch and a huge hill." Well that makes it a two-trick pony to me, not a one trick pony, and they are both awesome tricks. Great coaster. Once they hook this launch and top hat up to something like Nitro we'll have the best steel coaster ever. It does break down alot!!!! Every time I go to SFGA(Ive been there about 8 times) it shuts down at least once. I usually don't have a problem with it, but when I went to go on it one time it was closed. So i waited and after a half hour it opened again. I waited in a 20 minute line(what a miracle), but as I was going to literally be the next one to ride, the ride closed AGAIN. I waited for more than an hour because my friend didn't want to leave. Finally, I convinced him to leave. We then went on Superman and after waiting in a 30-45 minute line+riding it+eating, I looked over to Kingda Ka and saw IT STILL WASNT RUNNING! Glad I didnt wait that long. Liked this when I rode it last May, but didn't enjoy it as much as TTD when I rode that in 2008. Maybe it's because TTD was my first rocket coaster, dunno, but I remeber TTD being smoother, and the lap bars are definitely a plus. Also, even sitting front row, I felt NO airtime what so ever on that hill. On Stealth, in Thorpe, while only half as big, you do get airtime on both the top hat and the airtime hill before the breaks. "Thuggish city types" = a lovely, veiled desciption revealing your judgemental ignorance. Go back to nowhereville, tough guy. You're probably right. Not the best choice of words, but how would you describe people making gun references and laughing about it? Guns may be a part of life to some, but they aren't funny to me. How about 'gun enthusiasts'? Yeah, I'll go with that. I’ve heard some rumors and rumblings of Six Flags Great Adventure possibly adding a giant drop/free fall ride to the tower base of the Kingda Ka coaster in 2014. Six Flags Magic Mountain added a giant drop/free fall ride to the tower base of their Superman: Escape From Krypton coaster in 2011… known as Lex Luthor: Drop Of Doom. 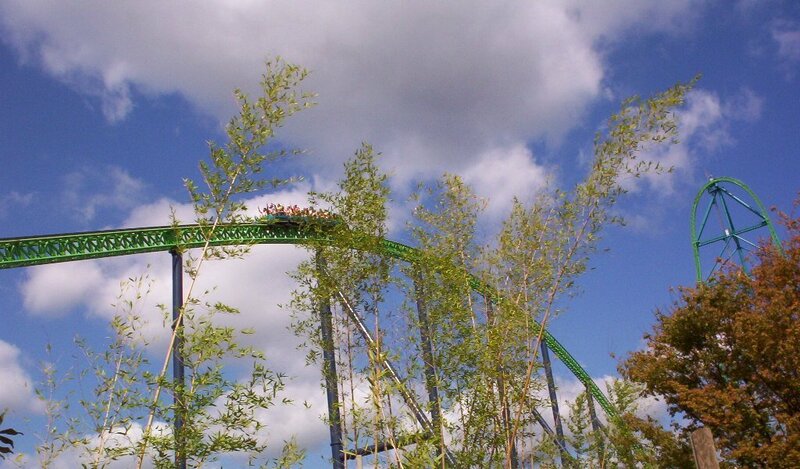 It would remain to be seen if SFGADV will be adding a giant drop/free fall ride to its Kingda Ka coaster in 2014.